News by Ginny W., Lindsay M., and Matt S.
Opinions on Before the Storm, the Life is Strange prequel focusing on Chloe’s life prior to Max’s return, are polarizing. I’m yet to full form an opinion, I do lean toward finding it honest and endearing — which means this news is great! Square Enix has put together two different physical editions of the Deck Nine title for release this spring. 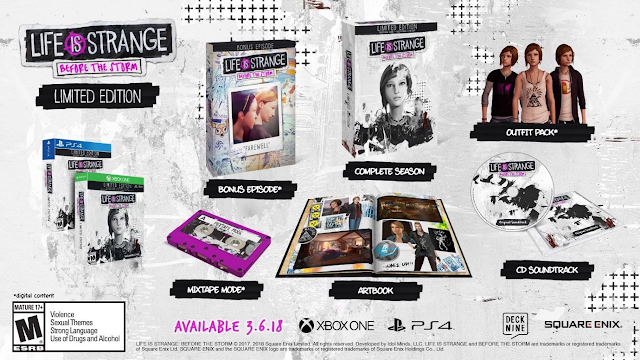 The Limited Edition (above) includes a physical art book and the soundtrack on CD. It also allows access to digital content including Mixtape Mode (originally only a pre-order bonus), an outfit pack (originally only a pre-order bonus), and episode one from the original Life is Strange. The Vinyl Edition includes the same, plus a vinyl set of the soundtrack. By pre-ordering soon via your region’s Square Enix store (if available), you’ll also receive adorable Chloe and Rachel figurines. The physical editions of Before the Storm are available on March 6 in North America and March 9 in Europe. Platform options are PC (Steam), PlayStation 4, and Xbox One. The previously-announced bonus episode, Farewell, will also launch digitally everywhere on March 6 — it is included as a digital download in the physical editions. Sadly this one isn’t coming to a platform that I can play it on (yet…), but PQube has announced that it is publishing an indie adventure game called Stay, and it’s looking really quite nice. Developed by a Spanish outfit, Stay is a game about a therapist that wakes up locked in a room that is empty save for a computer connected to an Internet chat room. And here’s where things get really interesting; the chat room’s only other person is you. As in you, the player. How you respond — and how quickly you do — will determine whether this man is able to escape, or if he perishes. The game continues even if you’re not playing. Log out for a while and the poor guy will have no one to talk to, which can start to take its toll. This system could well be broken if it demands too much of the player’s time, but it could also be an ingenious feature that could make Stay one of the most interesting games in 2018. You can watch the trailer above, and the game releases this spring (autumn for those of us in the south) for PC/Mac and Xbox One. Even though Hideo Kojima has long set his sights on his new foster child, Death Stranding, Metal Gear hasn’t been totally left to its own devices in the Konami basement. Enter Metal Gear: Survive, the first substantial whiff of the franchise since Kojima’s departure. While it’s not quite what we’re used to from the series, it looks like the developers have decided to take cues from what was hot on the market in 2017: survival sims. 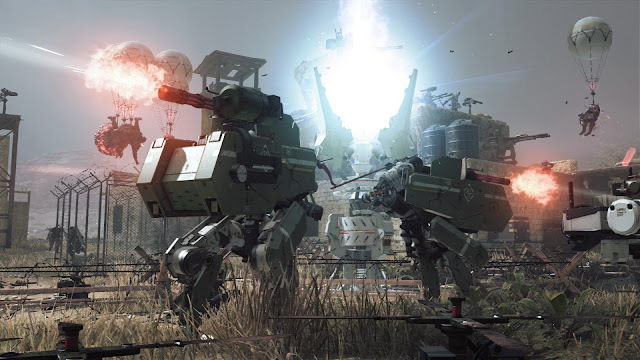 Metal Gear: Survive will be released on the PlayStation 4, Xbox One, and PC in mid-February and it’s just finished its latest beta round. For the uninitiated, you play as an unfortunate soul spit out by a wormhole who has to fight tooth and nail (literally) to survive. Think of Rust but add a little more polish and apocalyptic flair. From what we know so far about the game, you’ll have to do more than scrape together a campfire to get by; raising animals, growing crops, and developing popular weaponry from the series will all be key factors that influence your success. If you’ve felt like there’s been a Metal Gear-sized hole in your heart since its founding father departed, you can rest easy — February 22 is less than a month away. Neo Atlas is a charming little game. I enjoyed it a great deal on PC when I played it last year (my review here), but it’s also a game I’d rather play on console, as it feels more appropriate for that platform. A Vita version in Japan was never released out west, but hopefully this Switch edition that’s just been announced does happen. After all, the English translation is already there! The game will be be released in Japan on April 19. Developed by my favourite Japanese simulation developer Artdink, the Switch version is being released by Arc System Works… which gives me even more hope, as Arc System Works has been a big supporter of the Switch in the west. This is a very light simulator, and very easy for everyone to get into. The game has a good sense of humour, a lovely art style, and it features slightly randomised worlds, making each new play through the game just different enough (while still being realistic) to be worthwhile.